This textbook is geared towards first-year students in business programs who seek a sound understanding of economic reasoning without being bogged down by theoretical aspects relevant only to those intending to pursue studies in economics. The first part of the book explains how markets operate and how they are ultimately shaped by individual decisions of firms and consumers. It covers topics such as gains from trade and price formation in different market environments. Building upon that knowledge, the second part focuses on business decisions such as behaving strategically in the presence of competitors, making decisions under uncertainty, and dealing with asymmetric information. Students who master the contents of this book will be at a significant advantage in understanding the “big picture” of business environments. 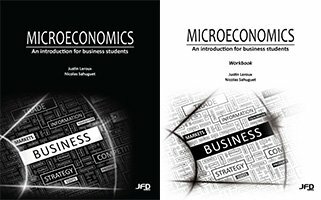 This workbook is a companion to Microeconomics – An introduction for business students. It outlines the contents of the textbook in a format that is conducive to taking notes. Answers to exercises found in the textbook are also provided.